Multi-position design – incline, decline and flat. 9 back rest incline levels, 4 seat bench incline levels. Adjust to suit your needs in seconds! 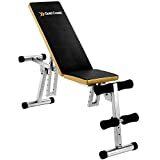 Cancel your expensive gym membership and work out in the comfort, convenience and privacy of your own home with the new Gold Coast Weights Bench. Perfect for inexperienced exercisers and fitness fanatics alike! The ultimate accessory to complete your home gym – train the legs, biceps, triceps, chest and shoulders. Used in conjunction with other fitness equipment, you can enjoy an individually tailored exercise programme which will work out every muscle group and deliver proven results! 3 incline angles – decline, incline and flat. 9 incline level back rest, 4 incline level seat bench. Easily adjustable to suit your needs, for a fuss-free professional workout. Sturdy tubular steel frame – complete with non-slip feet – offers fantastic stability, can safely withstand the most strenuous of workouts and supports a total weight of 150kg (330lbs). 4cm thick seat and back padding allows you to train in comfort for longer, for enhanced upper body strength and an impressive physique. High density cushioned foam knee and ankle supporting rollers provide a firm yet comfortable grip, allowing you to perform a wide range of exercises with ease. The incline/decline element of the bench, alongside the padded knee and ankle rollers, provide the user with a great way to perform sit ups and abdominal workouts. Incredibly simple to use – just select and adjust your incline using the central pin, and your workout can commence! Folding design gives you the option to fold flat and store the bench away conveniently in just a few easy steps – perfect if floor space is at a premium in your home. Contemporary black and gold design instantly adds a touch of style to any home gym. Measures 145 x 123.5 x 32 cm.